When I first arrived to Porto, the second largest city in Portugal, I was looking forward to seeing a different side of the country after spending all summer around Sintra. As usual, I didn’t wait long before turning to the streets and searched for street art to photograph. The panorama was quite different from what I found in Lisbon. The first thing that caught my eye, was the work by local artist Hazul. All over Porto’s center area, I found many of his pieces; most of them are neat unicolor works, filled with geometrical shapes. They’re both simple and intricate at the same time. Also, there’s a recurrent theme of virgins in his work. Before going to Porto, I was not familiar with Hazul’s work; but I really liked it and wanted to find out more about him online. However, there was not a great deal of information available on the internet, I only found an article by Portuguese magazine P3 (in Portuguese only). 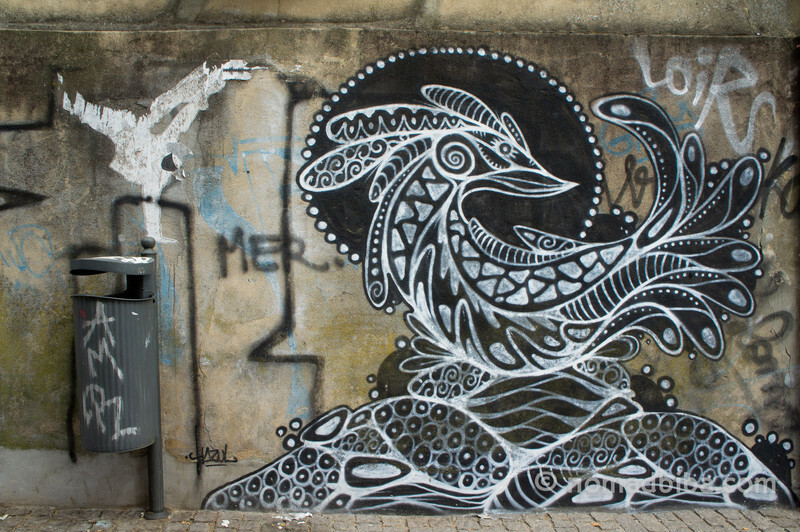 According to the article, Hazul says that it’s not too hard to find walls to paint in Porto, since there are brick walls around all closed buildings. Also, they say it takes him just about half an hour to complete a piece; he says his geometric style allows for an easy, quick and efficient way to occupy the space. On the other hand, Hazul also complains about a lack of support from the city, saying that it’s very difficult to get a permit to paint a wall. Maybe that’s why there aren’t many big murals in Porto. Most of the street art pieces that I found were in the small alleys of the city centre. 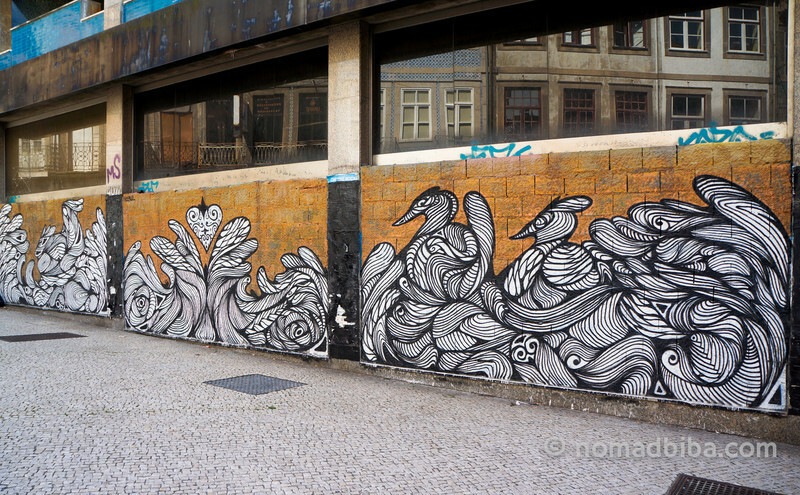 If you would like to see more photos of street art in Portugal, you should visit my gallery. We’re beginning to miss street art a little here in KL, there’s some, but not quite on the level of detail we’ve seen from your pictures from Porto. Perhaps we’ve just not discovered the gems here like you have just yet. I love street art, it makes some areas look so much nicer and more interesting. Love cleverly done street art like this! The artwork was very inviting . I love the HAZUL street art I am a street art maker . Follow nomadbiba's board Portugal on Pinterest.